Self-Esteem is a measure of how much you value, respect and feel confident about yourself. In the above diagram, the horizontal line shows competence, which means how good a person’s abilities are in doing or creating something. In this case -10 means very poor performance and +10 means highly successful performance. ‘0’ on each scale means average. The vertical line in the diagram shows worthiness, which is more of an internal feeling that tells how good one feels about her or himself. Here -10 on the scale means very depressed and self-hating state, on the contrary +10 is a very high level of self-worth. 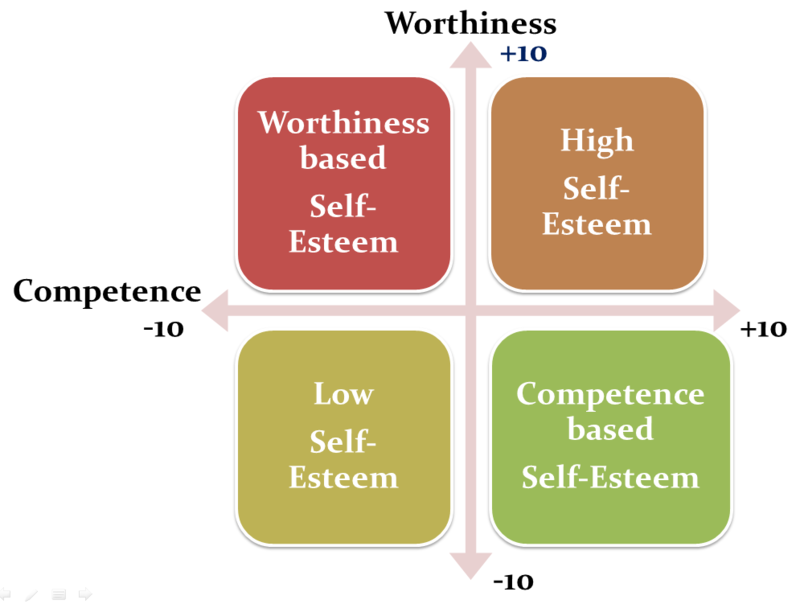 I am sure it is not the first time you have come across the word Self-Esteem but I think the quadrant gives us a clear picture. More importantly the two parameters – Competence and Worthiness. It was new to me. The fluidity of Self-Esteem: So, don’t be too happy if you currently fall in the 1st quadrant of ‘High Self-Esteem’, and don’t feel sad if you fall in the 3rd quadrant. The scores are not static, depending upon a situation or one’s mood it keeps changing. But we need to find where does it fall most of the time (average). Our behavior can tell us that. These people are more ambitious in what one hopes to experience in life. They are self-confident and wants to be with other self-confident people. They are capable of having open, honest and appropriate communications with others. They don’t worry about how others will judge them. They are nicer to be around, their ideas are met with interest because other want to hear what they have to say. These people are fearful of change. They are often uncertain of own thoughts and feelings; eventually losing faith in themselves. They have a hard time forgiving their mistakes and make them pay the price forever. They believe they can never be as good as they should be or as others. They are dissatisfied with their lives. They often complain, criticize and worry about everything and do nothing. If you think your scores didn’t match the characteristics then you may consider to re-evaluate yourself based on the 4 quadrants. And please don’t think of people while reading the ‘characteristics of people with Low Self-Esteem’. It is not a cool thing to do 😉 As parents, you may try to give the score to your child. With a purpose to nurture positive characteristics in them. It is actually recommended to do so. Share it with your family and we can have the entire family being plotted on the quadrants. It is a good exercise to do on weekends. By the way, if you are wondering how did I (science-maths person) come across this amazing content on human psychology then let me share the news. I am doing my Bachelors degree in Education (B.Ed.) from Mumbai University. The course content is fantastic and I am enjoying it. More interesting things are on the way, stay HIGH (on Self-Esteem) till we get our next article.